11842 PTE. M. COUPS. L.N.LAN.R. 15047 PTE. W. ROPER. L.N.LAN.R. Alfred Charles Ransdale (most often known simply as Chas) was born in Rosario, Argentina on 8th January 1895 and was the oldest child of Alfred Henry and Severa Ransdale (nee De La Paz Brandi). In 1895 his father was working as a book-keeper seemingly connected with the Santa Fe Western railway (Ferrocarril Oeste Santafesino (F.C.O.S) in Rosario). Alfred Charles (Alfredo Carlos) was baptised at St Bartholomew’s Anglican church in Rosario in December that year. His father Alfred Henry (1864-1945) was born in Paddington, Middlesex to English parents (George Lewis Ransdale and Jane Bailey) although in October 1911 when sailing back to Buenos Aires after a 3 month trip to the UK he recorded his nationality as being Argentinian. Alfred and Severa had five other children after Alfred Charles; Ethel (b. 1898), Jean Elizabeth (b. 1900), Ernest Edward (b. 1901), Amy (b. 1903) and Inez (b. 1905), all of whom were born in Rosario. Theirs wasn’t the only Ransdale family to have settled in Argentina. There were numerous Ransdale family members frequently sailing first-class back and forth between Buenos Aires and Liverpool or Southampton from the late 19th Century until at least into the 1950s. Between the ages of 7 and 9, he was at St Bartholomew’s school attached to the same church he was baptised. He then followed ‘the departing headteacher, George Robb, to his newly established English Commercial College (ArgBrit, 2009). At the time of the 1911 census Alfred Charles Ransdale was 16 years old and was a pupil at Shoreham college in the UK. Alfred, and probable cousin George Herbert Ransdale, had been studying at Shoreham since arriving in Liverpool on 9th June 1908. After his schooling Chas returned Rosario where he became a clerk for the River Plate Trust, Loan and Agency Company Ltd. They “made their profits by selling debentures bearing 4.5 per cent interest or less in the British Market and lending the proceeds at high rates to Argentines accustomed to paying dearly for their loans, particularly to those engaged in farming and stock-raising or in the real-estate business” (Rippy, 1966). 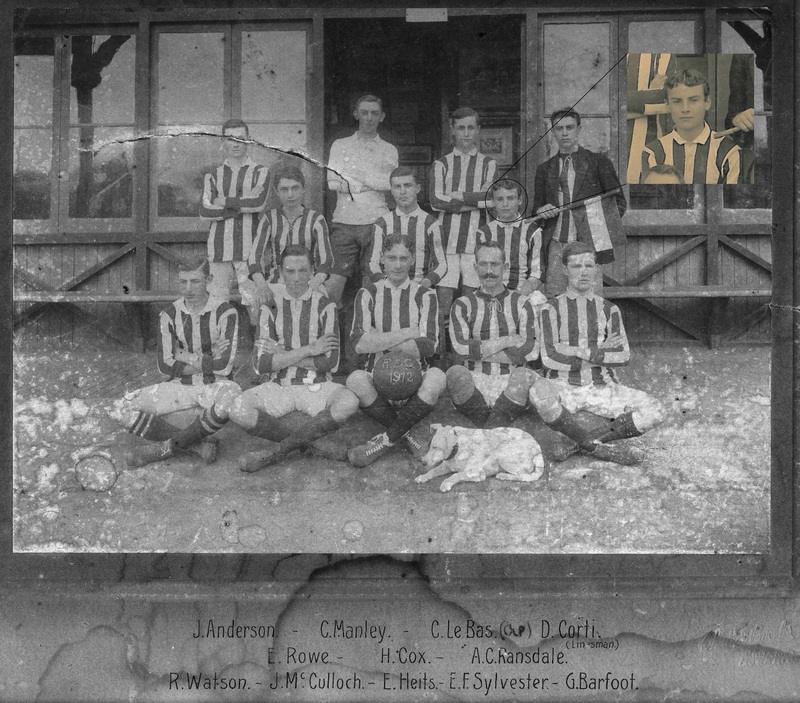 In 1912 he was playing football for the Rosario Athletic Club. He is pictured in the following photo along with other Great War Veterans, Cox and Watson. The final half of 1913 would have been difficult for Chas, losing his mother (Severa, aged 36) and paternal-grandmother (Jane, aged 82) within the space of 3 months. By 1915 he was 20 years old and was conscripted into the Argentinian Armed Forces. Conscription (Servicio Militar Obligatorio) began in Argentina in 1896 when a territorial war was feared with Chile and required all 20-years serve in the Armed Forces. Argentina remained neutral during World War I by decision of President Victorino de la Plaza. On 13th May 1917 he arrived at Liverpool from the Argentine on the Royal Mail Steam Packet Co. ship Desna. His purpose being to enlist in the British Army. Chas joined Lincolns Inn O.T.C as a private with the number 11495. His commanding officer at Pirbright wrote that Alfred was “Intelligent but is weak in topography, should do alright”. He commissioned into the Loyal North Lancashire Regiment the following year (L.G. 8th May 1918), initially joining the 3rd (Reserve) Battalion before being posted into the 15th Battalion as a Second Lieutenant. Second Lieutenant Alfred Charles Ransdale arrived in Belgium to join his Battalion on 27th August 1918 and in letters to relatives the same day expressed a fear he would not survive (GARDINER & MACKENZIE, 2007). He was killed four days later, 1st September 1918, during a heavy shelling of his works party out on the front line. One Coy (A) working under 41st Brigade revetting and laying of sandbags. C Coy working under 43rd Brigade in line – night party badly shelled, 2 /Lt A Ransdale killed, 1 OR slightly wounded (note C Coy were at I.7.d.3.1). B Coy filling shell holes on roads, relaying sleepers and creating guide posts. The 15th (Service) Battalion suffered just two officers and 12 other ranks killed during their short time in France and Belgium (July 1918 – June 1919). This is my wish and will that all I have and possess and anything which may be due to me at any time is Mabel’s. Please return to her any letters you are keeping for me that is: – all Mab’s letters to me. God bless you all and my beloved. God help me. You must treasure my treasure and do all to keep her happy and I’ll be happy too. I feel awful and it is a great will power to write this but now it’s done I feel ever so much happier. In the UK, Chas Ransdale is remembered at Shoreham Grammer School. In Rosario, St Bartholomew’s Anglican church where he was baptised and schooled display a brass plaque in his honour. The dedication reads ‘GREATER LOVE HATH NO MAN THAN THIS THAT A MAN LAY DOWN HIS LIFE FOR HIS FRIENDS’. Regiment/Service: The Loyal North Lancashire Regiment, 15th Bn. RIPPY, 1966. British Investments in Latin America, 1822-1949: A Case Study in the Operations of Private Enterprise in Retarded Regions. Dear Paul very good job, Alfred Charles was the brother of my grandfather and the history of his life is very full !!! Thank you very much for such a noble work that allows us to remember those who gave their lives thinking about a better world !!! Thank you very much Paul,your article will be very useful. Paul, Ernest Eduard was my grandfather! I, too, thank you Paul for such an interesting article. I was also interested to read your comments, Jorge. My grandmother, Maria, was also a Ransdale before she was married. She was a sister to Alfred, father of both Charles and Ernest. My sister reserched our family tree a few years ago and managed to go back as far as George Lewis Ransdale, father to Alfred and Maria. Thank you very much. Very informative. Alfred Charles Ransdale was my mother’s cousin (nee Veronica Gay, daughter of Marie Ransdale and granddaughter of George Lewis Ransdale and Jane Bailey. Would it be possible to pass this on to Jorge Eduardo Ransdale in case he has more family information. Thank you so much! Could have kicked myself when I read your article, have just sold Alfred’s victory medal a month or so ago. Hope the family picked it up. Where you get the info for this & the other entries is remarkable. Amazing Information! My Great Uncle will never be forgotten. Glad Jorge has found this page too!